Alterations in self-experience are increasingly attended to as relevant and important aspects of schizophrenia, and psychosis more broadly, through a burgeoning self-disorders (SD) literature. At the same time, issues of self, subject, and subjectivity within schizophrenia-spectrum illnesses have also gained attention from researchers across the social sciences and humanities, and from ethnographic research especially. 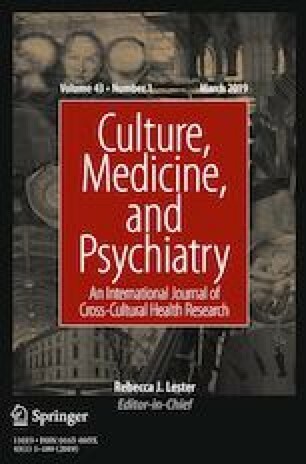 This paper examines the subjective experience of disruptions in self-identity within a cohort of first episode psychosis (FEP) service users, critically engaging with the SD literature and bringing it into conversation with social sciences and humanities scholarship on self and schizophrenia. Drawing findings from an ongoing ethnographic study of young peoples’ experiences with psychosis, we explore meanings of mental distress relating to psychotic episodes and attend to issues of self, identity, and subjectivity. We critique the division between “normal” and “pathological” self-experience that is endorsed within the SD literature, arguing against the notion that fragmentation of self-experience in schizophrenia-spectrum illnesses is indicative of psychopathology. We highlight how experiences categorized as psychosis are also important and complete aspects of one’s social world and inner life and explore the ways in which at least some aspects of disruptions of self-identity stem from clinical situations themselves—in particular, from asymmetries of power within the mental health system. Relating our findings to feminist, postcolonial, and disability studies’ approaches to the “self,” we emphasize the complex interplay between interpersonal, cultural, and structural aspects of self-experience within FEP. This work was supported by the University of Toronto Norris Scholar Award, an educational grant. The authors wish to acknowledge the generosity of the FEP clinic service users and family members in sharing their time and stories, and for constructive feedback from colleagues (especially Dr. Ada Jaarsma) and the reviewers of Culture, Medicine and Psychiatry. No authors have conflicts of interest to disclose related to this manuscript. All procedures performed in studies involving human participants were in accordance with the ethical standards of the institutional and/or national research committee and with the 1964 Helsinki declaration and its later amendments or comparable ethical standards. Informed consent was obtained from all individual participants included in the study. Ethics approval was granted under the CAMH REB (CAMH protocol 098-2014). Hannes, Karin 2011 Chapter 4: Critical appraisal of qualitative research. In Supplementary Guidance for Inclusion of Qualitative Research in Cochrane Systematic Reviews of Interventions, Version 1 (updated August 2011), ed. by J. Noyes, A. Booth, K. Hannes, A. Harden, J. Harris, S. Lewin, Lockwood C. Cochrane Collaboration Qualitative Methods Group. http://cqrmg.cochrane.org/supplemental-handbook-guidance. Willett, Cynthia, Ellie Anderson, and Diana Meyers 2016. Feminist Perspectives on the Self, The Stanford Encyclopedia of Philosophy (Winter 2016 Edition), ed. Edward N. Zalta, https://plato.stanford.edu/archives/win2016/entries/feminism-self/.